The Sega Master System was released in 1986 in North America. It came with a light gun called the Sega Light Phaser. In 1987 Atari released the XE Game System, which is technically a repackaged Atari 8 bit computer with a detachable keyboard and it was marketed as a video game console. It also came with a light gun, the Atari XG-1. Both systems were the direct competitors of the Nintendo Entertainment System (NES), which started its life in 1983 as the Nintendo Family Computer in Japan, and was later redesigned and released in the rest of the world as the NES in 1985. The NES came with a light gun known as the NES Zapper and a pack-in game Duck Hunt, which used the light gun. As direct competitors, Atari and Sega’s offerings also came with light guns and light gun games. While Nintendo’s gun is a simple light detector, both Atari and Sega guns are specialized light pens. They work by detecting the passing of the electron beam in front of their sights, sending an electric pulse to the computer when this happens, allowing it to determine the exact screen coordinates where the gun is pointed at. Sega games like Shooting Gallery take advantage of this superior detection method by displaying bullet holes on the background to represent your misfired shots in their exact positions. Nintendo’s gun can only detect if you’ve hit the (lit up) target, and nothing else. 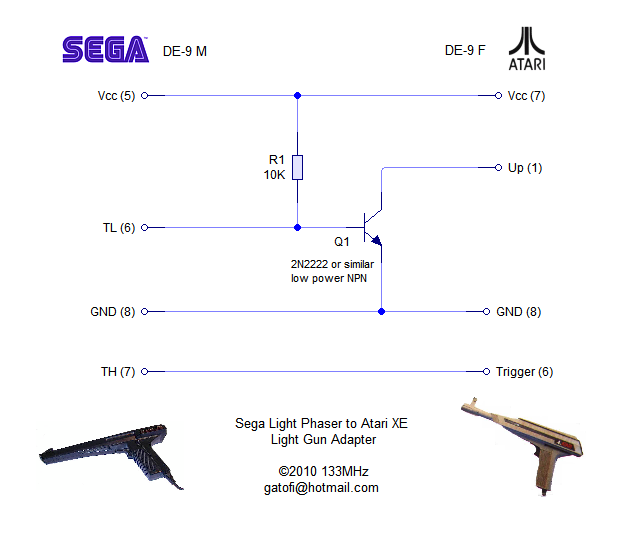 While Nintendo’s Zapper works on a simpler principle than their Atari and Sega counterparts, both Atari and Sega light guns work on the same “light pen” principle with only minor differences in their mode of operation, making possible to adapt a Sega gun for Atari operation and vice versa. The article provides the pin numbers for the Atari side, but only the wire colors on the Sega side. I opened up my Sega Light Phaser only to find out that the wire colors were completely different to the ones on the article! 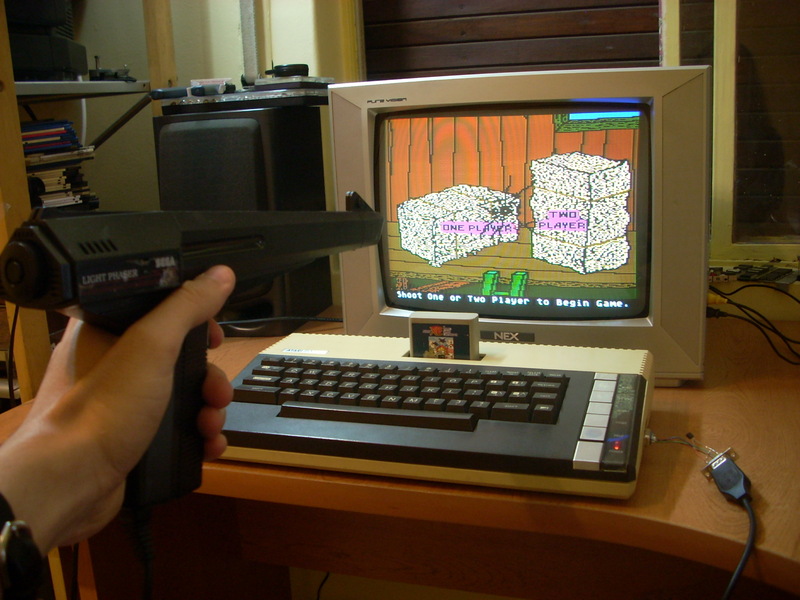 Due to differences between the Atari and the Sega system, when adapting a particular light gun for use on the opposite system, the trigger’s action will be reversed (the gun will fire when you release the trigger, or it will keep firing and only stop when the trigger is held down, depending on the game). The article suggests opening up the gun and rewiring the trigger microswitch to use the Normally Closed (NC) contacts instead of the usual Normally Open (NO). While it’s a perfectly valid solution, it requires modification of the gun itself. Once again, I opened up my Sega Light Phaser only to find out that the trigger microswitch is missing the NC terminal! With these problems in mind, I had to look up for my own solution to the problem. I didn’t want to modify the gun itself, and also I’d need to come up with something to correct the “reversed trigger” problem without replacing the microswitch. First I traced the pinouts on both sides in order to adapt the correct signals using a pair of DE-9 connectors. Besides power and ground, the Sega Light Phaser uses two special pins called TL and TH for communication with the console. TL is the trigger microswitch connection. When the trigger is pulled, TL is tied low, with no internal pull-up inside the light gun. TH carries the light pen pulses. In the Atari side of things, the trigger switch is read by the Joystick Up signal and the light pen pulses are read by the Joystick Fire signal. Therefore, TL must be hooked to Up and TH to Fire. This will get your Sega gun working in Atari light gun games, but there’s still the problem of the inverted trigger action. A single small signal NPN transistor inverts the trigger’s logic state, and a single 10k resistor provides the necessary pull-up to correctly bias the transistor’s base. The Atari’s joystick inputs already include internal pull-up resistors, making them unnecessary on the collector side. Now the circuit is simple enough to be built inside a D-connector housing, allowing the construction of a simple and clean light gun adapter using two DE-9 connectors. It works just as expected. The trigger action is fully corrected and it works perfectly on the Atari system just like it does on the Sega Master System. I tested it out with my two light gun enabled XE game cartridges: Barnyard Blaster and Crossbow. The opposite conversion (Atari gun to Sega system) can be done just as easily by building the same circuit but reversing the pinout on both sides. I haven’t tried the XG-1 myself but several sources on the Internet cite the Sega Light Phaser as being much more accurate. Either way, happy retro gaming! This entry was posted on 08/05/2010 at 2:29 PM and is filed under Electronics, Uncategorized, Video Games. You can follow any responses to this entry through the RSS 2.0 feed. You can leave a response, or trackback from your own site. It works, but pay very close attention to the “quick ‘n’ dirty” picture, since the numbers in the first diagram are kinda confusing. It would be better, if 133MHz would have shown the actual connectors looking into them, with lines showing what pins correspond to what number according to the first diagram. But as I said, It works, and kudos to 133MHz for figuring it out!